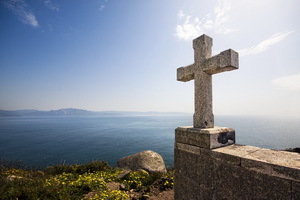 Finisterre, so named by the romans who really believed it to be so, although it is not the most westerly point of Spain at all. Pilgrims to Santiago have for centuries considered this to be their final destination after visiting the shrine of St James, and more recently they come here to burn their boots and clothes! The dangerous coastline, combined with proximity to the major shipping route between northern Europe and the mediterranean, has led to a large number of shipwrecks earning it the name of Costa de la Muerte - literally 'Coast of Death'!